There are a myriad of recruiting services that will take your money, list you on their website and hope a coach will find you. But college coaches do not have the time or resources to search for athletes on the hundreds of active recruiting sites. So, while a recruiting service may boast about their success, they only seem to work for elite athletes who are already on a coach's radar. The reality is: if you are not visible to coaches at the schools you want to attend, those post-and-pray recruiting sites will do little or nothing for you. 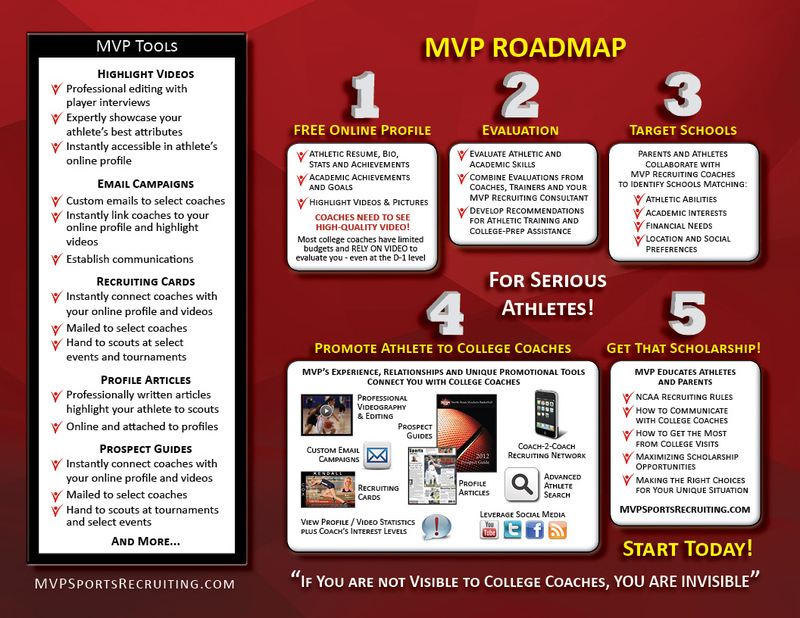 MVP is effective because we actively promote athletes to college coaches utilizing uniquely effective marketing tools that get you noticed. Our experienced staff will customize a promotional program and guide you through the entire recruiting process, so you can get Noticed, Evaluated and Recruited! 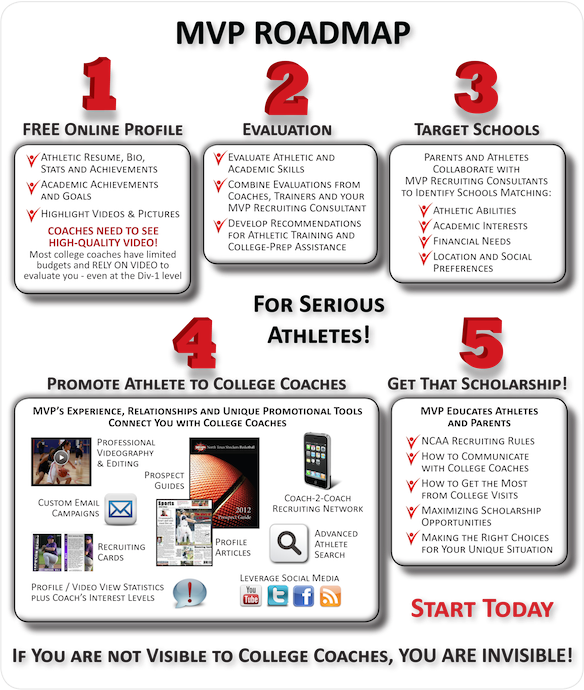 Register and post your MVP Athletic and Academic Profile online FREE! Upload current stats, pictures, achievements and more in our online database accessible by over 35,000 coaches at every NCAA Division I, II, III and NAIA school in the country. Great Videos Get YOU Noticed! VIDEO IS YOUR MOST IMPORTANT RECRUITMENT TOOL! With limited recruiting budgets, time and resources, coaches RELY on VIDEO to find and evaluate talent. While the Internet has made scouting easier and more cost effective, serious athletes need innovative ways to stand out from the crowd. A great video can elevate you above all the other talented athletes who are vying for the same scholarships. We can upload your great videos onto your MVP profile or you can take advantage of our professional video and editing crews (with decades of sports media experience) to produce a highlight video guaranteed to grab a coach's attention. 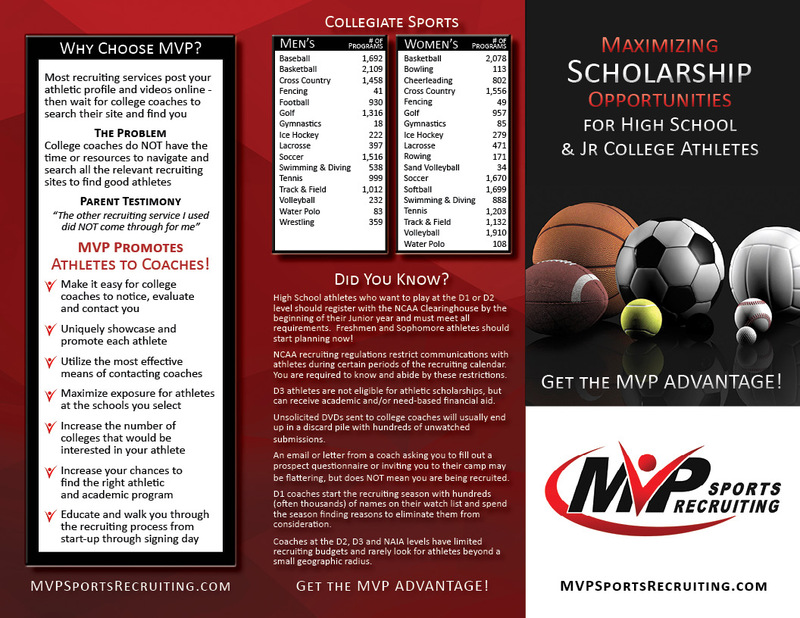 MVP utilizes your High School and Club coach's recommendations along with your personal Recruiting Coach's evaluation to help determine the best college programs for you. Your personal MVP Recruiting Coach may recommend local athletic trainers and programs to further develop your talents and skills. Depending on your academic history and goals, MVP may also recommend additional college prep assistance. Your talent and great videos may impress family and friends, but they won't help you get recruited if coaches don't see them. MVP promotional tools help athletes get their videos, bio, stats, athletic and academic accomplishments noticed by coaches at the schools with the best fit for that student-athlete. From customized email campaigns and recruiting card mailers to professionally written profile articles and prospect guides, MVP promotional tools are designed to capture a coach's attention and provide immediate access to your online profile and videos. With MVP, you select the schools that are the best fit for you athletically, academically, financially, physically and socially. Your personal MVP Recruiting Coach will work with you to develop a promotional program that meets your specific objectives. NCAA Division I and II schools have strict recruiting and communication rules that you must follow. Division III and NAIA schools are far more flexible with respect to recruiting windows and coach communications. Your personal MVP Recruiting Coach will help you understand and navigate all the rules. With MVP, you will know when [and which] coaches see your profile and videos, and if they indicate an interest in following or contacting you. Coaches may contact you with invitations to their camps, ask to see full game films, invite you to talk or even visit their schools. With MVP, you have a one-on-one Recruiting Coach to guide you through the entire recruiting process. MVP Sports Recruiting is fully compliant with NCAA eligibility rules and operates under NCAA bylaw 12.3.3.1., which states, “Talent Evaluation Services and Agents. A prospect may allow a scouting service or agent to distribute personal information (e.g., high-school academic and athletics records, physical statistics) to member institutions without jeopardizing his or her eligibility, provided the fee paid to such an agent is not based on placing the prospect in a collegiate institution as a recipient of institutional financial aid.” If you have further questions, please give us a call at 214-616-3616 or e-mail info@mvpsportsrecruiting.com.